Frontier has revealed details of its farmer contract to supply wheat to the Vivergo bioethanol plant, being built on Humberside. 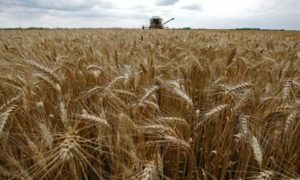 The factory will use 1.1m tonnes of wheat a year and is due to start production in mid 2011, with the demand for about 100,000t a month. Details of Frontier’s Humber Gold club for growers were unveiled yesterday (11 November), promising competitive prices and other incentives for those who signed up to supply a minimum of 120t of wheat. Farmers will be able to send wheat to the plant at up to 17% moisture, with any penalties promised at less than it would cost growers to dry grain to the contract standard of 15%, said Mr Flux. Other standard contract terms are a specific weight of 72kg/hl and 2% admixture, with payment on 21-day terms. Shorter payment terms of 14 and seven days will be available in some cases to encourage commitment and boost supplies at certain times. Contracts can be on a priced, unpriced or pool basis. All soft wheat varieties will be accepted, but for harvest 2012 there could be incentives, including delayed payment terms on seed, for growing high-starch varieties which produce better ethanol yields, said Mr Flux. The more grain a farmers commits through the Humber Gold club, the greater the benefits, said Mr Flux. For example, at 300t-plus there will be a moisture averaging benefit so that, as long as the whole contract is delivered at between 14 and 15.5% moisture, there would be no price penalty if the contract average is 15% or lower. Frontier’s Manchester Gold club, which supplies wheat for the Cargill starch plant near Manchester, includes a similar feature and it was this benefit that proved most popular with farmers, said Mr Flux. The Vivergo plant will have flexible opening hours, allowing farmers to arrange loading to suit their schedule. Quality analysis will also be available within 30 minutes of a load being tipped at the plant. Part of the service for Humber Gold growers will be a tool to evaluate the carbon score of their crop production, which would help them reduce their environmental impact, said Mr Flux. The Vivergo bioethanol factory is a joint venture between BP, British Sugar and DuPont.